If you’re trying to decide where to go for dinner, you can easily compare restaurant expensiveness online. Inexpensive restaurants are usually designated with one dollar sign, while expensive restaurants have three or four. But if you need to get care at a hospital, how can you know which are the most and least affordable? Depending on where you live, you could have a handful or dozens of choices—and until now, there was no way to see which are generally expensive, inexpensive, or average. Amino users now have access to Amino’s Facility Cost Rating. The Facility Cost Rating is an easy to understand, symbolic system of dollar signs ranging from one dollar sign denoting “inexpensive” to four dollar signs denoting “expensive.” It appears on the profiles of all facilities (hospitals, imaging centers, and urgent care centers) on Amino, as well as next to doctors’ facility affiliations and in our hospital affiliation filter. This makes it easy to compare facilities (like hospitals) by relative costliness. At a high level, you can see which are most expensive, which are least expensive, and which are just about average. You can also add your health insurance carrier to see a dollar sign specific to your insurance. By default, your search results will be sorted by Facility Cost Rating. For procedure X, Facility B charges 1.25x more than Facility A. The same is true for a different Service Y. We could say Facility B is 1.25 times expensive than Facility A. So if Facility A is assigned cost index of 2, we want to assign Facility B a cost index of 2.5. Note that the cost indices for the same facility could be different for a different payer. 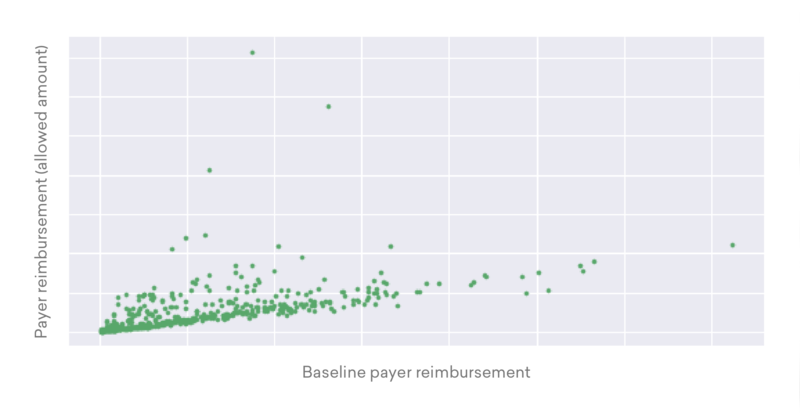 We use the costs observed for one of the major payers across facilities as the baseline for costs, and compute cost indices for different facility payer combinations as multipliers on top of those baseline costs. This approach adjusts for variation in costs due to location. Below is a real data sample comparing outpatient costs observed at a facility for a private insurance payer and the baseline. From the plot, you can see a linear relationship between the two payers. The slope of this line reflects the cost index that we calculate for that facility-payer combination. In reality, healthcare contracts are very complex and depend on a variety of factors including provider, payer, facility type, facility location, procedure, patient diagnosis, and so on. Our goal is to find a significant enough pattern in the prices across facilities so that we can order facilities by expensiveness. We believe that estimating multipliers using outpatient procedures across facility and payer combinations serves this purpose. Once we have the cost indices, we calculate the national average of all cost indices across all private insurance payers and a national average cost index for each payer. Next we compare each facility’s payer cost index to the national average cost index in order to determine its relative expensiveness. Facilities that charge near the national average cost index receive two dollar signs. For example, if the national average cost index for Acme Insurance Co. is 3x, all facilities with cost indices near 3x will receive two dollar signs when that payer is specified. Facilities that have less than the national average cost index will range from 1 dollar sign to 1.5 dollar signs . Facilities which have more than the national average cost index will range from 2.5 dollar signs up to 4 dollar signs. If you don’t specify a payer (aka your insurance), you’ll see an average rating across all payers for that facility. To produce this “all-payer rating,” we first take the existing cost indices for all payers associated with that facility and calculate the average (this is the “all-payer” cost index). Then we take the all-payer cost indices for all facilities and run the same calculation as we would for a specific payer—comparing the facility’s “all-payer” cost index with the national average cost index to produce the “all-payer” cost rating. Here’s how the distribution breaks down for all-payer cost ratings. Amino users also have access to Imaging Facility Cost Ratings. These are cost ratings designed to rate the relative expensiveness of imaging facilities where you can get MRIs, X-rays, CT Scans, and more. Imaging Facility Cost Ratings are provided separately from overall cost ratings because many facilities use different pricing strategies for imaging. For example, a facility that is cheaper for surgeries will sometimes be more expensive for imaging. We also consider that different facility types price imaging differently — freestanding imaging centers are commonly a cheaper option than hospitals. The Imaging Facility Cost Ratings share much of the same methodology as overall Facility Cost Ratings. We develop a Facility Cost Index for imaging procedures by facility and payer. When we don’t have enough confidence to produce an Imaging Facility Cost Index, we create a normalized index based on related information about the facility and their pricing patterns or facility type. We then take these indices and map them to dollar sign ratings to rank facilities by relative expensiveness.